We all gotta clean sometimes, whether it's to prepare for a spell or ritual or you just want to infuse some magic into your regular cleaning schedule. But harsh chemicals are icky. They can make you sick and they smell bad and they are disrespectful to the Earth. Seriously, we gotta quit with those. Working with natural cleaning agents is a great way to enhance the vibrational frequency of your home. Not to mention, it's a wonderful way to honor the Earth. 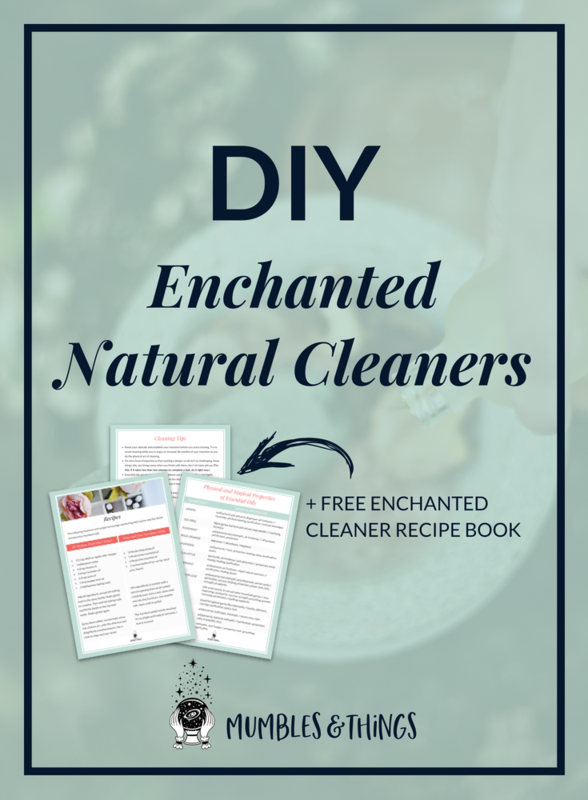 There are many natural cleaning products on the market, some that I use quite frequently. But if you're feeling particularly witchy, you may wish to make your own and infuse your personal magical intent. Start with base ingredients like vinegar, baking soda, and borax. Add the power of essential oils to create fresh, pleasing scents and an extra boost of magical energy. The following mixtures and recipes encourage connecting with nature and the divine during every mundane task. Add all ingredients except the baking soda to the spray bottle, shake gently to combine. Then add the baking soda and fill the bottle to the top with water. Shake gently again. Spray down tables, countertops, stove top, shelves etc. with this effective and delightfully scented mixture. Use a cloth to wipe and your done! Mix ingredients in a bottle with a narrow opening that can be sealed. Carefully pour onto a soft, clean cloth and rub onto furniture. Use another soft, clean cloth to polish. This furniture polish smells amazing! It's so bright and tropical. Seriously, I love it so much. Mix all ingredients in a glass jar that you can seal. Shake thoroughly to combine. Leave for at least 24 hours to allow oils to blend into baking soda. Sprinkle over carpet. Leave for fifteen minutes (remove and bar children and pets from area). Vacuum. These carpet sprinkles, not only cleanse the carpet magically, but they also release any pet hair and dander that is hard to vacuum. Fill a bucket with hot water and add the vinegar and oils. Choose the oils based on your intention. Some people prefer to have a dedicated mop for blessing a home. It's okay if that's not feasible. Floor washes are thought to remove evil spirits or negative energy. I like to use floor wash before the New Moon when banishing energies are strongest. Mix in a spray bottle and shake well before spraying. For no streaks, use newspaper or coffee filters to wipe off. Use microfiber cloth for no waste. Clean windows can do wonders for the energy flow of your home. It lets the sunlight in and your space will feel brighter. Mix everything in a spray bottle and shake. Wipe out any loose grease or food remnants with newspaper, before you start cleaning. Spray the solution, liberally inside the oven and let sit for 20 minutes. Wipe off with a clean cloth. If your oven is long-neglected, this concoction might not cut it. But it should do the trick for keeping a clean oven clean. If you are interested in kitchen witchery, your oven is arguably the most important part of your kitchen. If you are interested in eating cooked food, your oven is arguably the most important part of your kitchen. Keep in clean, folks! Reset your attitude and establish your intention before you start cleaning. Try to avoid cleaning while you're angry or stressed. Be mindful of your intention as you do the physical act of cleaning. Essential oils are wonderful tools but always use them safely. They are highly potent, so avoid getting them directly on the skin. If they do contact your skin, the best thing to do is use a carrier oil to dilute it (water drive oils deeper into the skin causing further irritation). Say a prayer or express gratitude in some way when you finish cleaning. Your attitude from start to finish will influence the energy of your space. Here's another freebie! If you want a handy booklet to keep track of these recipes, click the button, enter your information and download the pdf booklet. What do you do to magically clean your home? Tell me about your practice in the comments below.